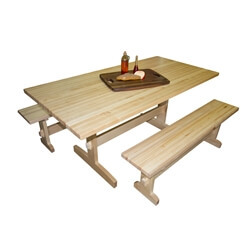 This hard maple trestle table and bench set is hand-crafted with through mortise and tenon joints and hard maple edge grain top with full length rails. They are unique and beautifully crafted pieces of fine furniture that will add a hint of flair to your dining experience. These table and benches are made with full length continuous rail edge grain butcher block top.